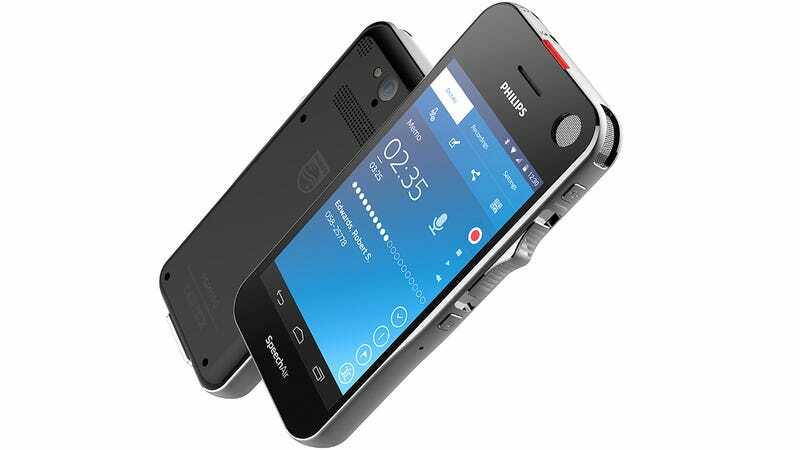 Philips New Android Smartphone Includes—Wait, That's Just a Voice Recorder? It might look like a chunky smartphone with the design stylings and dimensions reminiscent of the original iPhone, but Philips’ new Android-powered SpeechAir is actually a dedicated voice recorder with a touchscreen, wi-fi connectivity, and even a camera on the back. So why not just use your smartphone with a decent microphone attached? For most of us, who only occasionally need to record a conversation, that should suffice. But for professionals who are capturing voice memos all day long, like lawyers or doctors, a dedicated device means you’re not killing your smartphone’s battery in the process. Because the SpeechAir is specifically designed for dictation, it features buttons on the side dedicated to quickly starting and stopping recordings as soon as you pick it up. You don’t have to dig for an app buried in a folder somewhere every time you want to use it. The device also features three generously-sized 360-degree microphones built into its upper right corner, so there’s no need to awkwardly hold it upside down like when you have a mic accessory attached to a smartphone. And the camera on the back lets you annotate recordings with a photo or a product, since it doubles as a barcode scanner making it especially useful in the medical profession. Transferring recordings to a computer is accomplished via Bluetooth, wi-fi, or by using the recorder’s included dock, but Philips has not revealed pricing details for the device just yet. If it ends up being too expensive, all the features in the world won’t convince people to switch from the device they’ve already got in-hand all day.